There is more banning happening on the 2+2, but this time it’s surprisingly not from the powers that be running the popular forum. Poster Mephisto uses an avatar of image created by Japanese artist Takashi Murakami. 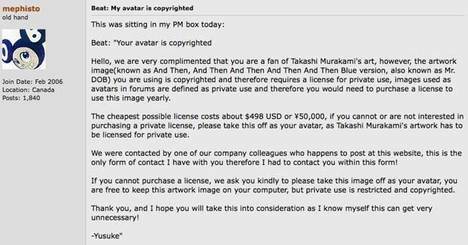 For use of this 80×70 pixel avatar on 2+2, Takashi wants to get paid. $500. For use. Of an avatar. And we thought China was the communist country. Read more about it on Techcrunch here. Call me crazy, but that sounds a lot like… capitalism.